In 1589 Sir Walter Ralegh, the Elizabethan courtier, was mayor of the port town of Youghal and owner of 42,000 acres across Counties Cork and Waterford. A few years before Ralegh organised an expedition to Virginia in the New World where a temporary settlement was made. A favourite of Queen Elizabeth, Sir Walter Ralegh had a colourful life in an age of colourful characters. But while mayor of Youghal, Sir Walter Ralegh met a character who was even then becoming a legend, Catherine Fitzgerald, the Old Countess of Desmond. Many years later, when writing his book the History of the World (Book 1, chapter V, section 5) Sir Walter Ralegh wrote “I myself knew the Old Countess of Desmond of Inchiquin, in Munster, who lived in the year 1589, and many years since, who was married in Edward the Fourth’s time, and held her jointure from all the Earls of Desmond since then, and that this is true, all the noblemen and gentlemen of Munster can witness”. Catherine Fitzgerald was the only daughter of John Fitzgerald of Dromana, Lord of the Decies by his wife, Ellen, daughter of Sir John FitzGibbon, the White Knight. 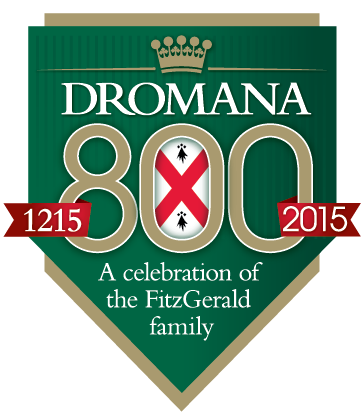 Catherine Fitzgerald had one brother, Gerald Fitzgerald, who succeeded to the Dromana estates on the death of his father on 17th April 1533. John Fitzgerald, Lord of the Decies, was the son and heir of Gerald Mór who was in turn the second son of James Fitzgerald, 7th Earl of Desmond (died 1462). The eldest son of the 7th Earl of Desmond was Thomas Fitzgerald, 8th Earl of Desmond. Earl Thomas served as Lord Deputy of Ireland to George, Duke of Clarence from 1463 to 1467. But by early 1468 he had fallen out of favour with King Edward IV and was arrested and beheaded at the Parliament at Drogheda in February 1468 on a charge of extorting coyne and livery contrary to statute. Thomas Fitzgerald, 8th Earl of Desmond, left five sons of whom the third was Thomas Fitzthomas Fitzgerald, also called Thomas the Bald. Thomas Fitzgerald was born about 1454 and twice married. His first wife was Shelia (or Gille), daughter of Cormac Laidir McTeig McCarthy, Lord of Muskerry by his wife Mary, daughter of Edmund Fitzmaurice, Baron of Kerry and Lixnaw. The second wife of Edmund Fitzmaurice was Amy, daughter of Turlough Mac-I-Brien-Ara, and widow of James Fitzmaurice Fitzgerald, 11th Earl of Desmond. Gille ny Cormac was living in June 1505 when she was granted a lease on Corbynne, Co. Cork by Gerald Fitzthomas Fitzgerald, Earl of Kildare. It is not clear what became of Gille ny Cormac: was she divorced or did she died? Sometime after 1505 and before he became Earl of Desmond in 1529, Thomas Fitzthomas Fitzgerald married Catherine Fitzgerald of Dromana. It is said that Catherine Fitzgerald was born in 1464 and married Thomas Fitzgerald when she was twenty which was 1484 and that she danced with Richard, Duke of Gloucester, at her wedding. The only Richard, Duke of Gloucester, living around 1484 was Richard Plantagenet, eight but third surviving son and eleventh child of Richard Plantagenet, Duke of York by Cecily, daughter of Ralph Neville, Earl of Westmoreland. The Duke of Gloucester’s brother was King Edward IV and when the latter died in April 1483 the Duke of Gloucester assumed the crown in place of the two sons of Edward IV as King Richard III. After a short reign Richard III was killed at the Battle of Bosworth in August 1485 and Henry Tudor, the victor of the battle, became King Henry VII. After Richard Plantagenet there was no Duke of Gloucester until the reign of King James I. There is no evidence that Richard, Duke of Gloucester travelled to Ireland and it is very unlikely that he was at the wedding of Catherine Fitzgerald of Dromana. Thomas Fitzgerald had Gille ny Cormac as his wife until at least 1505 and so could not married Catherine Fitzgerald until after then by which time Richard, Duke of Gloucester, was over twenty years dead. Instead the association of Richard, Duke of Gloucester, with Catherine Fitzgerald had a number of political undertones which would make the story useful. The succeeding Tudor dynasty threw all the bad news items into the time of King Richard III to help justify their own shaky hold on the throne. Having Catherine Fitzgerald, the Old Countess of Desmond, associated with Richard Plantagenet allowed others to challenge her property titles and make her look disloyal to the Tudor dynasty. It is also to be noted the Tudor supporters do not even given Richard his title as King Richard III if they claimed that he was at Catherine’s wedding in 1484. Sir Walter Ralegh went further back than 1484 and claimed that Catherine Fitzgerald was married in the time of King Edward IV, i.e. before April 1483. This claims runs contrary to what has being just said above and must be dismissed as a fantasy story. Ralegh was a Tudor supporter, and even though he wrote his History of the World in 1614 during the time of the Stuart dynasty, there were still many Tudor supporters in positions of power and Ralegh locked up in the Tower of London seeking release. In June 1529 James Fitzmaurice Fitzgerald, 11th Earl of Desmond and son of Maurice Fitzthomas Fitzgerald, 10th Earl of Desmond (who was second son of the 8th Earl of Desmond), died at Dingle or Rathkeale without issue. Thomas Fitzthomas Fitzgerald succeeded to the Earldom. The new Earl was “Far-famed … in feats of arms; in nine battles he won the palm of victory”, wrote the Bishop of Coimbra, Fr. Dominic O’Daly, Emperor Charles V’s ambassador to England. At the succession of Thomas Fitzgerald to the Earldom, his wife, Catherine Fitzgerald of Dromana, thus became Countess of Desmond. Shortly after becoming Earl, Thomas Fitzgerald made a treaty with the Dromana Fitzgeralds in which he conferred upon them many benefits. The treaty relieved the Dromana Fitzgeralds of providing entertainment whenever the Earl entered the Decies and from the need to assemble the fighting men of Decies for the review of the Earl. The Dromana Fitzgeralds even got the right to defend Dungarvan Castle against the forces of the Earl of Desmond while also receiving a third of the port revenues. This treaty made the Dromana Fitzgeralds very independent of the Earls of Desmond and would contribute to the Battle of Affane in 1565 and the start of the decline of the Earldom. Thomas Fitzthomas Fitzgerald, 12th Earl of Desmond, died at Rathkeale in 1534 aged 80 years (his death hastened by giving up his grandson to the English court) and was buried at Youghal. His burial place in Youghal was the South Abbey (Franciscan Friary) where six other Earls of Desmond were buried. There are no traces of this Friary now remaining. With her husband’s death Catherine Fitzgerald of Dromana became the dowager Countess of Desmond. It is said that Thomas and Catherine Fitzgerald had only one child named Katherine who married Philip Barry Oge. The son and heir of the 12th Earl of Desmond, by his first marriage, Maurice Fitzthomas, had predeceased his father and so the 12th Earl was succeeded by grandson, James Fitzmaurice Fitzgerald. James Fitzgerald had been sent by his grandfather to England and was raised at the English court. On becoming the 13th Earl of Desmond, James Fitzgerald returned to Ireland but he little enjoyed the title as the fourth son of the 8th Earl of Desmond, Sir John of Desmond, had assumed the title. James Fitzgerald found it difficult to battle this opposition and he was murdered on the Friday before Palm Sunday, 1539/40 by his cousin, Sir Maurice FitzJohn Fitzgerald, whose brother became the 14th Earl of Desmond. The widow of the 13th Earl, Mary, daughter of Cormac Og McCarthy (brother of Gille ny Cormac mentioned above) thus also became a dowager Countess of Desmond. Sometime after 1540 she married Daniel O’Sullivan Mór and died in 1548 leaving the Old Countess of Desmond as the sole dowager Countess. The 14th Earl of Desmond, James Fitzjohn Fitzgerald, married firstly his grand-niece, Joan, daughter of Maurice Roche, Lord Fermoy, by his wife Eleanor, daughter of Sir Maurice Fitzgerald, the 14th Earl’s younger brother. On the grounds of consanguinity James Fitzjohn reputed the marriage and before 1533 married More O’Carroll, daughter of Sir Maolrony O’Carroll. When James Fitzjohn became Earl of Desmond in 1534, More O’Carroll became Countess of Desmond. More O’Carroll died in 1548 and the 14th married before February 1550 Catherine, widow of Richard Power, Baron le Power, and daughter of Piers Butler, Earl of Ossory and Ormond. But Catherine Butler was not long as Countess of Desmond before she died in March 1553. Later that year the 14th Earl married for the fourth time. His new bride was Eveleen McCarthy, daughter of Donal McCarthy, son of Cormac Ladrach McCarthy. The 14th Earl finally died in 1558 and Countess Eveleen soon after married Conor O’Brien, 3rd Earl of Thomond, before she died in 1560 leaving Catherine Fitzgerald of Dromana as the sole Old Countess of Desmond. The next Earl of Desmond was Garret Fitzgerald, 15th Earl, called the Rebel Earl, who at his death in 1583 became the last effective Earl of Desmond. Garret Fitzgerald married twice. His first wife was in 1550 or 1551 when he married his second cousin, Joan, daughter and ole heir of James Fitzmaurice Fitzgerald, 11th Earl of Desmond. Joan had two previous husbands, James Butler, Earl of Ossory and Ormond, and Sir Francis Bryan. Joan Fitzgerald became Countess of Desmond in 1558 and died in January 1565 without children. The 15th Earl of Desmond them married before January 1568 to Eleanor, daughter of Edmund Butler, Baron Dunboyne by Cecily, daughter of Cormac Og McCarthy, Lord of Muskerry. When the 15th Earl was killed in 1583 there were two dowager Countesses of Desmond – a young Countess and an old Countess. Thus when Sir Walter Ralegh was mayor of Youghal in 1589 he dealt with the Old Countess of Desmond. Catherine Fitzgerald was possibly about ninety years old by that time and so was old in years but she was also the older Countess of Desmond. Rev. 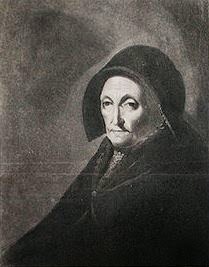 Samuel Hayman, and others, accredited Catherine Fitzgerald in her old age as Countess of Desmond travelling to Bristol and from there to London to solicit relief for her condition after the ruin of the House of Desmond in 1583. But this story seems to be based on confusion with the younger Countess of Desmond, Eleanor Butler, who in 1589 was described as “in want of meat, drink and clothes”. Shortly after Thomas Fitzgerald became the 12th Earl of Desmond, he granted to his wife, Catherine Fitzgerald of Dromana, the manor and castle of Inchiquin, west of Youghal along with thirty-three marks of yearly rent in County Kerry to hold during her life. The deed of grant (made about 1530), said that previous Countesses of Desmond were formerly possessed of this income including Eblina Roche. This latter woman is presumingly Ellen Roche, daughter of Maurice Roche, Lord Roche of Fermoy, and first wife of Maurice Fitzthomas Fitzgerald, 10th Earl of Desmond. After the death of her husband in 1534, Catherine Fitzgerald should have got one third of the entire Earldom of Desmond for the rest of her life but the Earldom of Desmond rarely played by the rules. In 1572 a survey of the lands held by the Earl of Desmond stated that the Old Countess of Desmond still held the manor and castle Inchiquin for life. In 1575 it is said that Catherine Fitzgerald reverted the manor of Inchiquin to the then 15th Earl of Desmond. After his attainder in 1583 Inchiquin passed in 1585 to Sir Walter Ralegh. As the town of Youghal formed part of the manor of Inchiquin so Ralegh had to deal with the Old Countess when he was mayor in 1585. 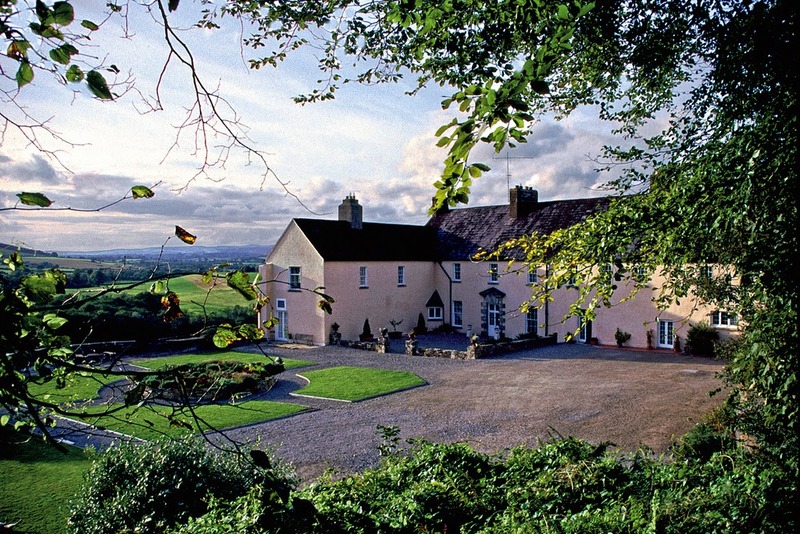 In 1602 Sir Richard Boyle purchased all of Ralegh’s Irish estates including Inchiquin. Both New English planters thought that the old lady would not live long more and so allowed her stay at Inchiquin. Catherine Fitzgerald, the Old Countess of Desmond, died in the year 1604 according to Sir George Carew. The eventual cause of her death was said to be from a fall from a cherry tree, into which she had climbed to get at the fruit. As Thomas Moore wrote “That she lived to much more than a hundred and ten; And was killed by a fall from a cherry tree then; What a frisky old girl!” The Earl of Leicester described her death as “she must needs climb a nut tree to gather nuts, so falling down”. Rev. Samuel Hayman dismissed this as “idle fiction”. The Old Countess of Desmond was buried in the South Abbey at Youghal, near to the grave of her husband who died seventy years before. If the Old Countess of Desmond did fall off a cherry tree, her manor of Inchiquin was not the most famous place for cherry trees. In the neighbour of Affane, located a few miles south of Cappoquin and a few miles north of Dromana, it is said that Sir Walter Ralegh first introduced a fine species of cherry tree which he had brought from the Canary Islands. Affane was famous in the 1740s for the best cherries in the country. This cherry tree became so popular across the country that it took its name as the “Affane Cherry”. It is difficult to establish which type of cherry tree that was introduced into Ireland around the time of 1600. There are a number of contending varieties. These include Gean or Wild cherry (Prunus avium) which is native to Europe, Western Asia and North Africa; Bird cherry (Prunas padus) is another European/Asian species; Sour cherry (Prunas cerasus) is native to southeast Europe and southwest Asia; Cherry laurel (Prunas laurocerasus) is more a hedge variety and is native to southeast Europe and Asia; and Portugal laurel (Prunas lusitanica) is a bushy tree from Spain and Portugal. This last species would be a possible candidate for the Ralegh cherry tree as the Canary Islands were, and are, owned by Spain. Sir William Temple, in his book Essay on Health and Long Life, said that Catherine Fitzgerald lived to be above 140 years. Sir Walter Ralegh wrote of the Old Countess of Desmond in the past tense in his History of the World in 1614 which would suggest that Catherine Fitzgerald was dead by that time. Granger said that the Old Countess of Desmond died much later than 1614 and it was about 1625 that she died and thus gave her age as about 162 years old. William Thoms in his book of 1872, Human Longevity, said Catherine Fitzgerald died in 1604 aged 140 years, i.e. born in 1464. This assertion was possibly based on the writings of Fynes Moryson in 1617 in which he wrote that “in our time, the Irish Countess of Desmond lived to the age of about 140 years, being able to go on foot four or five miles to the market town and using weekly so to do in her last years, and not many years before she died she had all her teeth renewed”. This age of 140 years is said by some to be a corruption of 104 years. The 104 years is generated by saying that Catherine Fitzgerald married Thomas Fitzgerald in about 1521 when Catherine was twenty one years old. Catherine’s nephew, Sir Maurice Fitzgerald of Dromana, 1st and last Viscount of Decies, was born 1530 to Gerald Fitzgerald (Catherine’s brother) and his wife Ellen Butler, daughter of 8th Earl of Ormond. If we allow thirty years for each generation, which is the usual number given in such calculations; this would give about 1500 for the birth of Catherine’s brother Gerald. If Gerald Fitzgerald was born about 1500 then it is likely that Catherine Fitzgerald was also born about that time. It is likely that Catherine Fitzgerald, the Old Countess of Desmond, was about 100 years old at the time of her death in 1604 give or take 5 or 10 years. This was a very old age for the time when most people would be dead by 50 or 60. Catherine was also the old Countess of Desmond about 1600 because Eleanor Butler was the young Countess of Desmond and she lived until 1636 and was buried in Sligo Abbey.